and had an interesting target(I'm skipping the other stuff, at least for now). 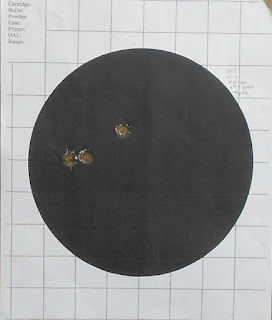 This is .45-70, using the Lyman 340-grain hollowpoint* cast of 20-1, over 29.5 grains of A5744 propellant. Used the sizing die to iron out the mouth flare and crimp it. 100 yards. What makes it real interesting is that on two shots, looking through the scope, I thought I'd somehow missed the whole target, which didn't make sense: I've had good results with this combination(different crimp) before, and the shots felt right. Then I got the target and saw that those two holes on the left are a bit larger, a touch oval-shaped, than they should be... Holy crap. I need to reshoot these, two groups: one with this crimp, one with standard crimp, because this is the tightest group I've ever had with this bullet, and I need to see if I just had a real good day, or if that one difference makes that much difference.